A multimedia extravaganza for the senses! A tour of North American bird habitats, from the Arctic Tundra to a Cypress Swamp, rendered in full-colour, three-dimensional landscapes, enhanced with choruses of authentic bird calls and songs. Another spectacular, interactive delight from master paper engineers Robert Sabuda and Matthew Reinhart. Saber-toothed tigers and wooly mammoths are among the highlights, with snippets of trivia that should encourage kids' desire for further knowledge. The 3-D artwork swings off the page, bringing spiders, bald eagles, crocodiles, tigers, and polar bears to life. Filled with interesting facts and statistics. The Santoros' next title: Wild Oceans. A good introduction to insects for ages 3 and up. The language is clear and easy to understand, and the large print makes it easy to read. Chapters progress logically, beginning with a definition of an insect, followed by descriptions of its body parts, its mating and reproduction habits, and its unique characteristics. Spectacular close-up photographs add to the book's appeal. Includes a brief glossary and index. This noisy book tells the story of a Canadian Goose and his mate. The male goose spends most of his time chasing foes away from the nest until "crack! crick! peep!" six baby geese are hatched. Acclaimed artist Robert Bateman invites young readers to join him on a journey to the Arctic and Antarctica. Fascinating facts and profiles of the polar inhabitants, including polar bears, penguins, seals, and whales, are brought vividly to life in Bateman’s paintings and sketches. An engaging and informative book. When a baby is born, older siblings sometimes feel left out. The arrival of a baby is special, but becoming an older brother or sister is special too. Celebrate their new status with a book. Fabio is an only dog, but he longs for a brother. When his family decides to adopt another dog, she's not at all what he expected. A hilarious story about acceptance. Koala Lou is loved by everyone, especially her mother who never fails to tell her "Koala Lou, I do love you!" When her mother has more babies and gets too busy, she doesn't say the words as often. To win back her mother's love, Koala Lou tries to win a medal at the Bush Olympics. Perfect for older siblings who need a little reassurance. 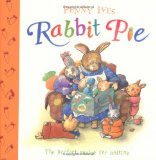 Easy-to-read stories for a child and a parent to read together, or for an older child to read with a younger one. I gave this book to a 7-year-old; her dad later told me that she'd been trying to read it with her baby sister! 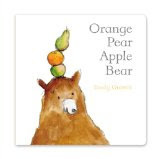 Wordless picture books are ideal because a child can make up his or her own story to go with the pictures. Good for kids who are unsure about reading words out loud. Wordless books can also stimulate the imagination. For curious kids who want to know where they came from. The parents in this book come up with creative, imaginative answers: you were grown in the garden, you were delivered by fairies, you were dropped from a spaceship, etc. For kids who want answers, but don't need too much detail. The map of the woman's reproductive system is very vague, and the actual coupling is hidden under sheets, but most kids should get the idea. Suitable for ages 2-3. The Mole Sister series by Roslyn Schwartz are gentle, humorous, light and dreamy. 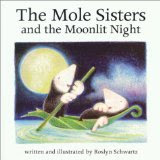 In the above story, the Mole Sisters discover that anything can happen on a moonlit night. In 2006, Marie-Louise Gay was awarded the Vicky Metcalf Award, which recognizes a writers' work to be of high literary quality. Ms. Gay's Stella series, as well as her other stories, are distinguished by exuberant, joyful illustrations and imaginative writing. 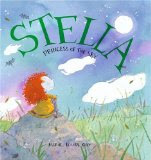 In Stella, Princess of the Sky, Stella reassures her little brother, Sam when they spend the night outdoors. Every evening, Old Woman and the animals serenade the moon. When Coyote wants to join in, the animals recoil in horror, telling him that his terrible singing voice will scare Moon away. "Hummph," says Coyote, whose feelings are hurt. "Why would anyone want to sing to Moon, anyway? In fact, he thinks, who needs the moon? He then says, "That silly Moon is so bright, I can hardly sleep." Unfortunately, Moon overhears him. Offended, she takes refuge in the pond, leaving the world in the dark. When Old Woman and the animals fail to entice Moon back, they resort to one last, desperate scheme to return her to the sky. For kids and grown-ups who like to howl. There are many versions of the Ark story, just as there are many different kinds of Ark toys, from soft stuffed versions to elaborate wooden carvings. The story of the Ark is timeless and appeals to both children and adults. Here are a few Ark books to enjoy. Imagine all the animals packed into Noah's ark, pushing and shoving each other to find room. As the Ark rocks gently in the seas, the animals fall asleep. Then Noah's granddaughter tiptoes around, untangling paws, tails, and wings in this original story. A retelling of the classic Bible story with Reinhart's colourful and amzing paper sculptures. A captivating book. Sandy and Dennys inadvertently interfere with their parents' experiment and find themselves transported to a different time and place, though still on Earth. They must find a way to get home before many waters flood the desert. A magical story about love. For ages 10 and up. An interesting take on the Ark story with a tyrannical Noah, a talking cat, a unicorn, and a mutiny. For ages 14 and up. A tale about a hill, an old man, and a flood. With detailed, tinted illustrations.